Installing advanced security cameras is one of the easiest ways to protect your property. Whether you’re a small business with a single store, a larger retailer operating in multiple locations, a homeowner, university, or government agency, you need a security camera system with the right features. Start here by looking into cameras and complete systems with the features most important to your operation. When you’re ready, order online or reach out to our team of security experts for a free consultation. We’ll work with you to implement a professional system that has all the right features, saving you thousands of dollars in the process. To get the best level of detail captured by your security cameras, it’s advisable to go for higher resolution cameras - at least 4MP (2K) resolution which is the industry standard today for advanced security surveillance or 8MP (4K) resolution, also called ultra-HD surveillance. As one of the core security camera features, higher resolution means a better quality of images and videos captured. Remote monitoring is perhaps the most important new security camera system feature of the past decade. Remote monitoring allows you to view live video surveillance of your security cameras from anywhere on your PC, mobile phone or tablet. This gives you the flexibility to monitor your property, staff, and operations from anywhere with an internet connection. All our HD and IP security cameras at CCTV Security Pros support remote monitoring on any internet-enabled devices. Easily scan a QR code on your NVR to enjoy mobile remote viewing from anywhere you are. The ability to capture infrared light is a state-of-the-art security camera feature. Infrared cameras effectively have night vision that can see 100 feet or more in complete darkness, and even further in dim light. Your infrared cameras will work at all hours of the day or night, switching to the correct mode automatically. This makes them great indoors and out. 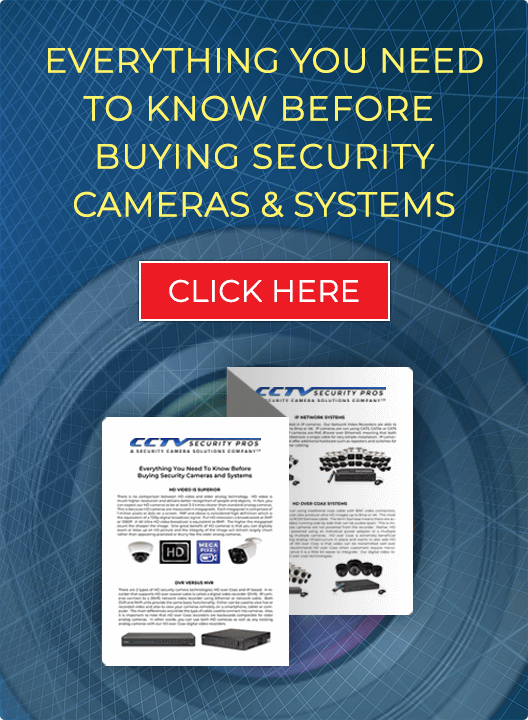 CCTV Security Pros offers a selection of infrared bullet cameras with a host of other features. If you own or manage a large building like a grocery store or office that traditionally operates its lights 24/7 in the interest of security, you can save money by installing cameras that don’t need them at night. Security systems are traditionally time consuming and expensive to install. That’s not the case anymore. CCTV Security Pros systems are plug-&-play. If you and your staff can run an Ethernet or Coax cable from each camera to the back of your DVR or NVR, then you’re all set. Congratulations, you just saved hundreds or thousands of dollars over traditional installation costs! Features like remote viewing are also easy to set up. Scan a QR code on the back of your recorder, follow a few simple prompts, and you will be able to view your cameras right on your phone from anywhere, at any time. Security surveillance cameras have to prove reliable both indoors and outdoors. However, for outdoor cameras that are constantly exposed to a wide range of weather elements throughout the year, the weather-resistant features of security camera systems are a must. This ensures that the cameras are protected against adverse weather elements and able to provide quality images and video footage at all times. Our waterproof outdoor security cameras feature weather-resistant housing to ensure durability and superior performance. Security cameras are one of the best ways to deter theft, vandalism, burglary, and other criminal activity. Criminals will often try to damage or disable these cameras. Many CCTV Security Pros security cameras come with vandal-proof housing, so they can withstand significant force trauma and keep recording. These are the durable models that will take a beating and keep working fine for year after year. 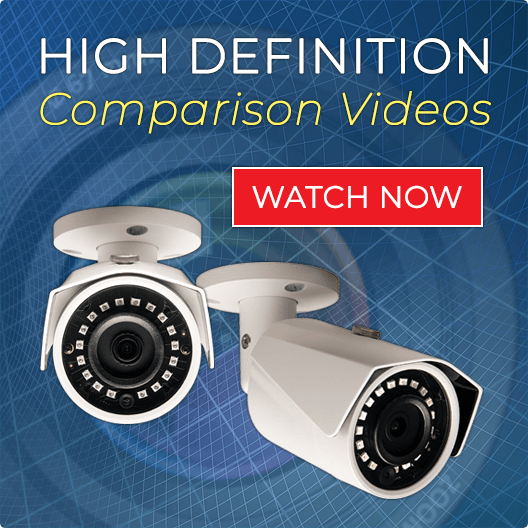 Every business has its own unique security and video surveillance needs. That’s why buying security cameras with customizable features is highly recommended. You’ll want to select the type of surveillance options you need that works as part of a complete security system. This way you can mix and match cameras with different types and capabilities on the same network. A wide-angle lens camera for the parking lot, a long-range camera for the hallway, and a 4K camera to catch faces coming through the front door are all possible. Further customize your system in with advanced recording features. Choose to record videos 24/7, on motion detection, or on your own schedule. Decide how long to keep old footage for. Opt into notifications by text or email. Our customizable security camera features help you design a surveillance system that best suits your business surveillance needs. Pan, Tilt, Zoom cameras (PTZ) are a great way to extend the surveillance coverage of a single camera installation and get the most value out of it. But you don’t need staff or equip an entire room with guards and monitors to use them. PTZ cameras can be viewed and controlled right from any computer, tablet, or smartphone. You can even use preset viewing tours to customize your coverage. Your cameras caught the footage, now you can view and retrieve it with any connected device. Easily skim through hours of video to find the event you’re looking for with clips tagged by detected motion, right from your smartphone, tablet, or computer. CCTV Security Pros offers cutting-edge Digital Video Recorders and Network Video Recorders to help you record and playback surveillance footage with ease. Even the most advanced security camera features are only useful if they actually work! The surveillance equipment you source through CCTV Security Pros comes with the support of a team of security experts based in the United States. Install your plug & play system yourself with our help to save thousands in installation costs. Something go wrong? Get us on the phone! We’ll walk you through a solution step by step. Whether you want a dome security camera for wide-angle surveillance, a PTZ controllable security camera for monitoring busy business areas or another type of security camera for your indoor or outdoor surveillance needs, CCTV Security Pros is your leading provider of commercial-grade security cameras and systems in the U.S. Find a complete security camera system with features you can count on. Order your security cameras online 24/7, or call us at 888.653.2288.